Easel Cards are fun and easy to make! An easel card is easy to make and a nice variation from the ordinary card. Take a long rectangular piece of card and make two folds to create three even sections. You can do this by measuring or bringing the long edges over one another until the surfaces are even and then pushing down on the edges to make the folds. Decorate the front of the easel card as shown in the photo. 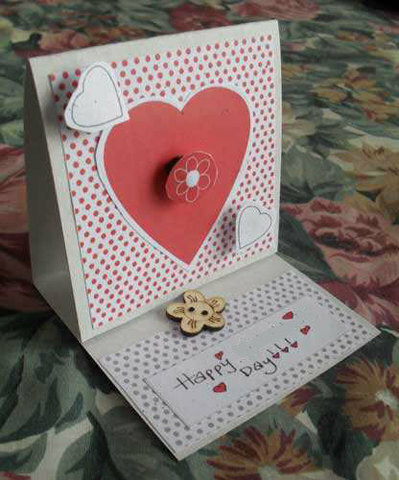 Stick a button or bead where indicated in the photo to act as a 'stopper' so the card will stand. Decorate the space beneath the stopper. 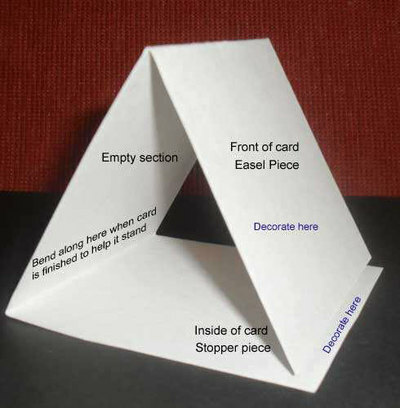 Bend the card along the fold at the top of the stopper section a few times to make the card stand properly. Give your cards a little dimension by raising cut out images off the paper gluing them to pieces of foam or cardboard. Make the easel card any size you like.